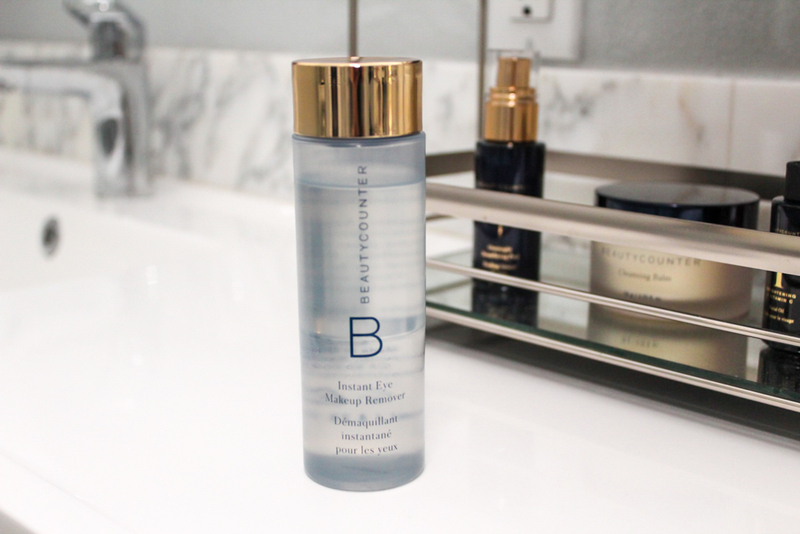 Let’s talk all about skincare and my favorite Beautycounter products! I can’t believe it took me so many years to finally develop a skincare regimen, you know? I should have done it much sooner, but now that I’ve been on a regular routine for maybe six months, my skin is looking great (after a fairly rough postpartum period). 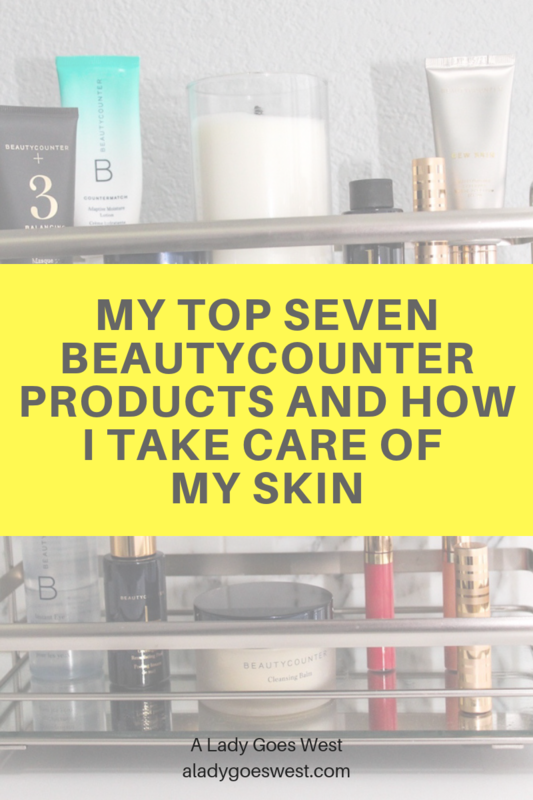 Before using Beautycounter, I sort’ve dabbled in whatever products I picked up at the store, sometimes trying to find organic or nontoxic, but never really having anything solid in place like I do now. 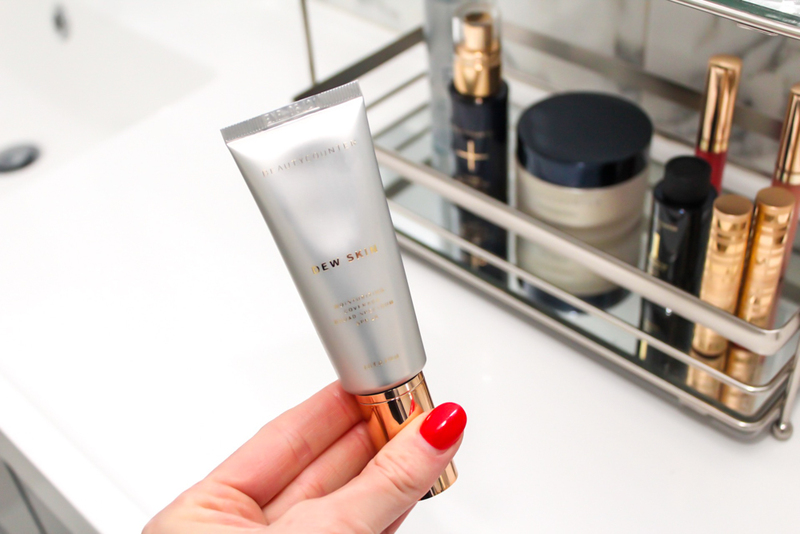 Quick note: I’m a Beautycounter consultant, and all of these links are attached to my personal Beautycounter sales. If you choose to click on them and order anything, I will get credit. If you have any questions about what products may work for you, please reach out to me. You can also try taking this skincare quiz today for some guidance! One of the most important things to me when it comes to skincare and make-up is that the products are safe and don’t include a lot of harsh chemicals that are found in most conventional products — no parabens, no artificial fragrance, nor sulfates. I know that everything I use from Beautycounter is safe — no toxins — nothing that will seep into the bloodstream and make me sick or build up and turn into something worse. 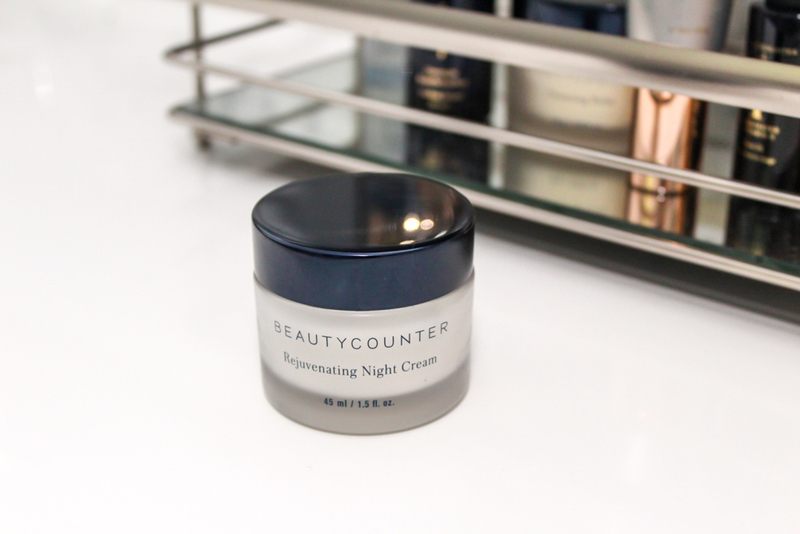 (Beautycounter bans 1,500 ingredients on their “Never List.”) Especially after what I went through to heal my hormones and get pregnant, I’m not about to take any chances with questionable products, even if they are best-sellers in stores. I learned. I know better. Plus, I spend a lot of time exercising, eating mostly healthy food and keeping myself totally balanced, so it’s only fitting that I choose wiser when it comes to what I’m putting on my skin. Wouldn’t you agree? Let’s get to my faves … and by the way, I originally wrote this post as my five top favorites, but couldn’t live with that and had to add a sixth. I use this bar every single night to wash my face, and it gets my face squeaky clean. If you have skin that tends to get drier, I’d use this only once a day or maybe every other day. I really haven’t had a breakout since I’ve been using this bar. I have a cute little soap dish I keep the bar on in my bathroom drawer. This face bar would work great for guys too. It gets rid of make-up and leaves your face a blank clean slate, with just one rinse. I use this every single night. See more about the Charcoal Face Bar here. I use this face mask once a week, and it’s such a treat. The dark grey color is pretty awesome, because you can tell exactly where you are applying it. You wash your face, dry your face, then add a thin layer of the mask to your face and let it harden a bit (doesn’t get so hard that it itches though, which is nice). Dave and Brady get a real kick out of seeing me with this on. If your skin is on the drier side, I’d only use once a week. This, combined with the charcoal face bar, has completely rid my skin of any blackheads, large pores or breakouts. My skin is completely clear because of them, and I’m quite pleased with it. I use this once a week. See more about the No. 3 Balancing Charcoal Mask here. I think this product has been the biggest game changer for my skin. Everyone who tries it agrees. You wash your face as your normally would at night, then apply this overnight resurfacing peel and let it sit. It will tingle quite a bit. After about 10 to 15 minutes, you can apply your regular night cream and go to bed. In the morning, your skin will have a fresh and dewy glow. It’s the BEST. I use this on my face the night before I know I will be taking photos or have an event or a party, just to give my skin an extra bit of plump. It reduces redness, helps with fine lines and more. Here’s a fun fact: Lately, I’ve been applying this to my chest and neck too (areas we tend to forget, but start to show age early), and they are improving. I use this three times a week. See more about the Overnight Resurfacing Peel here. You can also get it in travel size. This is my foundation, and it goes on so smoothly and provides just the right amount of coverage. I wear shade 2, and did I mention it has SPF 20 in it? It does! I don’t like to have caked-on make-up, and I like a liquid foundation, so this one is perfect for me. 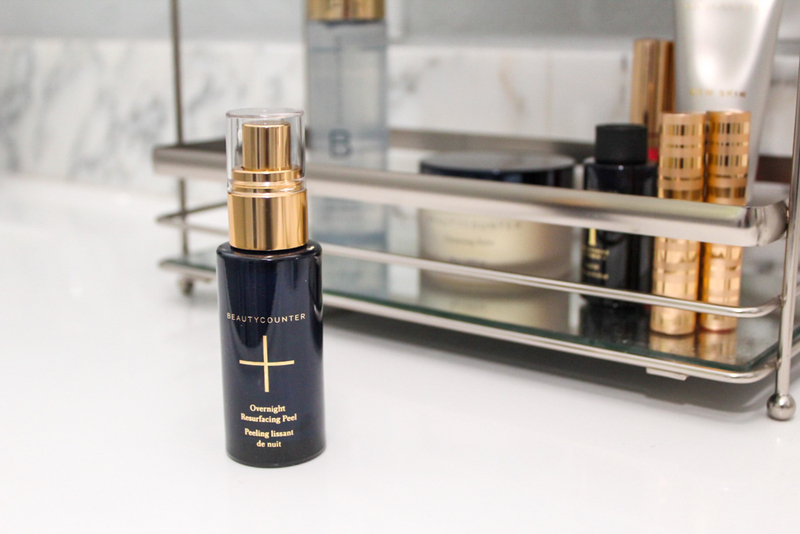 Beautycounter also has a much more fuller coverage liquid called the Tint Skin, but I haven’t tried it because I’m so in love with the Dew Skin. I use this maybe four days a week, when I actually wear make-up on my face. See more about the Dew Skin Moisturizing Coverage here. I wear this most days, because it’s just the perfect tint. Right now, my favorite shade is rose, but there are others I have my eye on. I also just received the bright red Color Intense lipstick for weekends, and I’m pretty excited about it — it’s a GORGEOUS and bold color. I put it on Friday afternoon and it stayed with me until I ate dinner that night — looking bright and amazing. My lips are naturally really light, so I always like to have colored lip gloss or the sheer lipstick on them. I wear this almost every day. 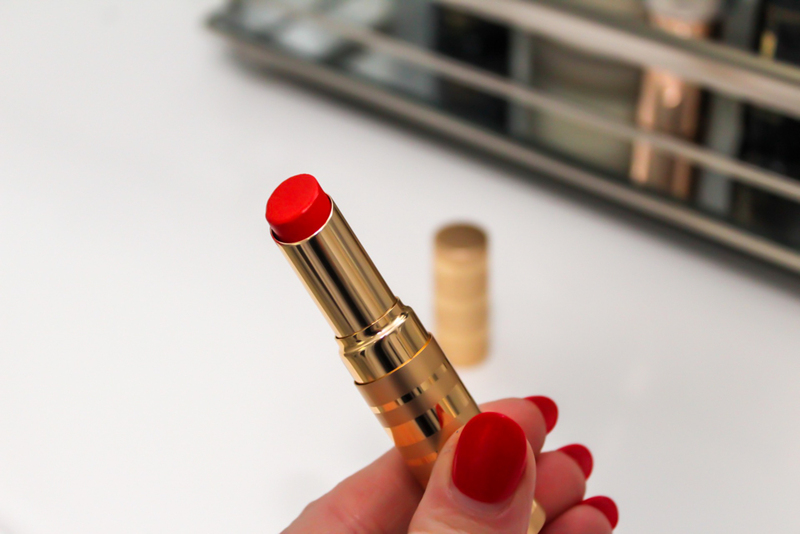 See more about the Sheer Lipstick here. And the Color Intense Lipstick here. I use this night cream every single night after I wash my face and after I’ve done a mask or overnight peel, if I’m doing one of those. It goes on so creamy and gives me just the right amount of moisture. I love the little jar too, because it’s glass and feels fancy! I have an unopened bottle of the Rejuvenating Day Cream that I’m going to jump into next too, so I’ll report back on that. I use this nightly. See more about the Rejuvenating Night Cream here. I had a big tub of this luxurious Cleansing Balm for far too long before using it. I don’t know what I was waiting for. If you are only going to get one product, this multi-use item may be it. You can clean your face and moisturize it all at the same time. The other night, I washed my face with my Charcoal Face Bar, then added the Cleansing Balm as an overnight mask. In the morning, my face was so soft and nourished. I washed it off and was so pleased, and that’s mostly how I use this product. Love the smell, consistency and how the Cleansing Balm totally treats the skin. I use this a couple times a week. See more about the Cleansing Balm here. This Eye Make-up Remover works better than any other eye make-up remover I’ve ever used. The bottles lasts for so long too. I highly recommend! The No. 1 Brightening Facial Oil smells sooo good. You apply it before your daily moisturizer and it gives your skin a nice dewy glow under make-up. This Lip Gloss is another daily staple, in both bellini and peony. Drink a LOT of water. Even though I’m not breastfeeding any more, I still aim to drink maybe 120 ounces of water a day or so. I sometimes fall short, but I always try. Eat lots of veggies. Veggies have antioxidants, which help your body and your skin. Sleep. Sleep is everything, and it gives your skin a chance to renew and recover, so you’ve got to get sleep. Can’t you tell on your face when you haven’t slept well? I can! Collagen. Collagen helps with the elasticity of your skin, so I supplement with it daily. I put this collagen in my morning tea and have this collagen in an afternoon matcha latte. Keeping it simple. I don’t use 8 million products, I only use a few, and they are safe and they work. In the morning, I wash my face with water only and pat it dry. Then I apply this Countermatch Adaptive Daily Moisturizer. Sometimes I wear make-up, sometimes I don’t. I almost always wear mascara and lip gloss. I don’t do anything else to my skin all day until after I shower at night. Then, I wash my face with my charcoal bar, dry my face, once a week I use the charcoal mask, three times a week I use the overnight peel, maybe once or twice a week I use the balm, and every night I apply the Rejuvenating Night Cream before I go to bed. That’s it. There are a number of amazing eye creams, oils, serums that work SO well, but I don’t like to use too much, so I think I’m in a sweet spot, where my skin looks good, and my routine isn’t taking me all day to do. I may add a face oil back in regularly, because I do love the way that looks, and this face oil is my fave. I’m so glad I finally realized the importance of finding and using the right stuff on my skin regularly, because it’s definitely made a difference! And I’m having a lot of fun with this brand and company — helping other beautiful people find the right products that they can feel good about using. If you have any questions about Beautycounter products, please don’t hesitate to reach out to me via email or a DM on Instagram. 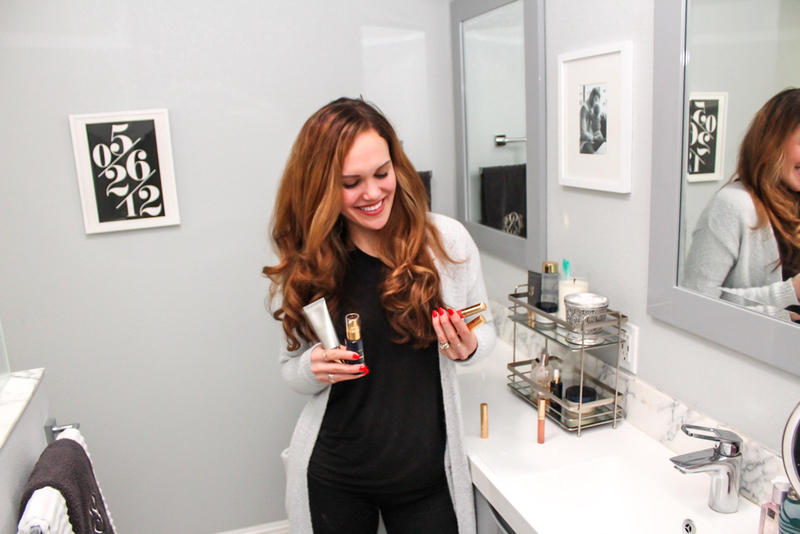 And to all of my lady friends who haven’t started a skincare routine yet … get ON IT! Don’t forget to stay hydrated today! P.S. NEWS! If you are interested in learning more about the Beautycounter business opportunity, the enrollment fee is slashed in half this week until March 7 with starter kits. 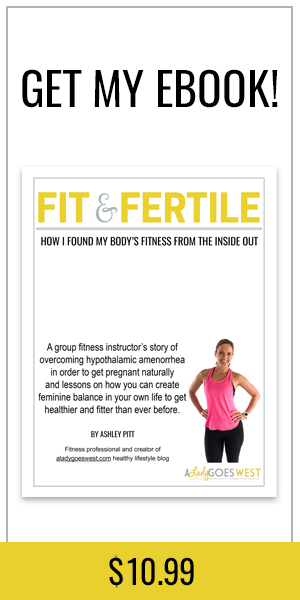 Let me know if you want to know more how to get set up — it’s super easy and so fun! What’s your favorite type of make-up? Do you look at the ingredients list of your body and face products? 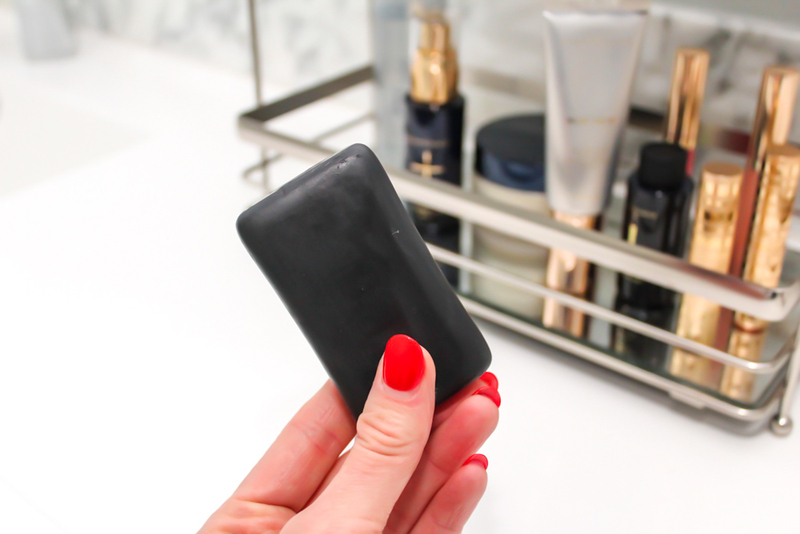 Beautycounter’s Charcoal Bar changed my life! I’m in my late 30’s and was still dealing with breakouts, excess oil, etc. My husband and I both use it religiously. 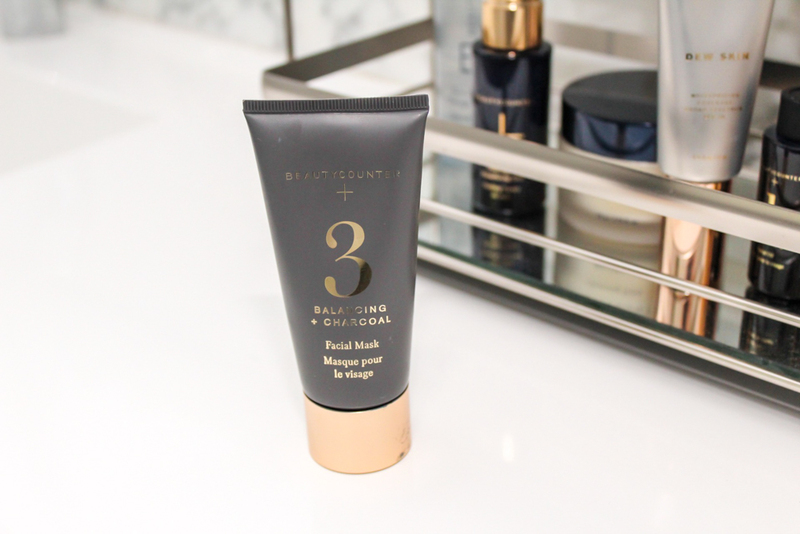 Coupled with the #3 Balancing Oil, the occasional charcoal mask (plus overnight spot treatments with it!) my skin looks better now than it did 10 years ago! Im currently obsessed with their brow gel – it’s a game changer! Hi Lindsay, I’m so to hear the peel hasn’t worked well for you. Have you tried giving your face a really good scrub before hand? Then apply a bit more of the peel and see if that works. Maybe your skin is just not very sensitive and it’s working without the tingle? And I meant the Resurfacing Peel. Not sure what I put originally lol.